As of this morning, 516 people have signed the petition. Have you? Join the campaign and help get our Presidential candidates to sit up and take notice of the need for more meaningful federal involvement in restoring the health of the Chesapeake Bay and addressing serious water quality issues affecting waterways throughout America. * The Chesapeake Bay Foundation (CBF) is an independent, nonpartisan 501(c)(3) organization dedicated to protecting the Chesapeake Bay and its rivers and streams. It does not endorse candidates. CBF is running a fictional candidate, Captain John Smith, to elevate the Bay and clean water in the presidential election. And you thought he was dead! 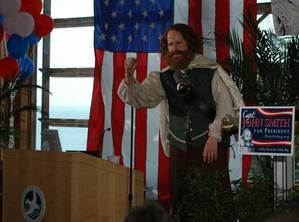 Yes,it's true, the man who explored and mapped the Chesapeake Bay 400 years ago has announced his candidacy for President*. He is running on a platform to clean up the Chesapeake Bay and waterways nationwide. Smith made his announcement yesterday from his campaign headquarters at the Chesapeake Bay Foundation's Phillip Merrill Center in Annapolis. "My vision is for a clean and restored Chesapeake Bay, with abundant fish, crabs, and oysters, a region with healthy farms and a vibrant seafood economy, just like in the old days," the red-bearded explorer said. "But I stand not just for a clean Chesapeake Bay; I stand for clean rivers and streams all across America. For if we can clean up the Chesapeake Bay—and working together we bloody well can—we can clean up every stream, river, and bay in this country. We can make the Chesapeake a model for restoration success, for the rest of the nation and for the rest of the world."